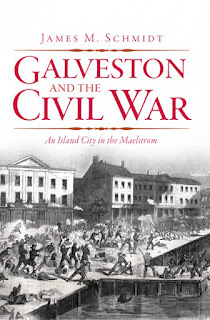 Schmidt: "GALVESTON AND THE CIVIL WAR: An Island City in the Maelstrom"
It is often said that not much happened in Texas during the Civil War, but the citizens of Galveston would beg to differ. The most famous Civil War event attached to the city is undoubtedly the dramatic and improbably successful Confederate January 1, 1863 combined operation that ejected Union forces and retook the port. It's history has been ably recounted in books and articles, most notably by Edward Cotham's excellent study Battle on the Bay: The Civil War Struggle for Galveston (University of Texas Press, 1998). 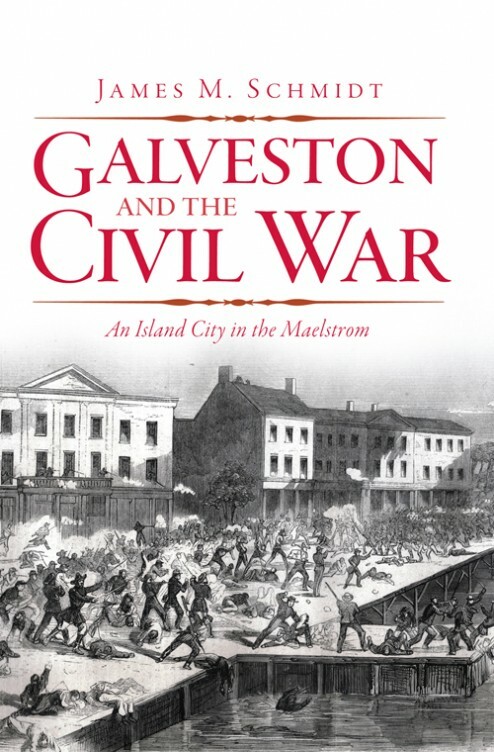 Although the military situation remains an important part of James Schmidt's Galveston and the Civil War: An Island City in the Maelstrom, the book also highlights the tribulations of the local civilian and slave populations. Having a fine natural harbor and a rail link to the Texas interior via nearby Houston, Galveston was an important port city in peacetime and war. It was deeply invested in the institution of slavery [according to Schmidt, Galveston had the largest slave market west of New Orleans] and Schmidt's book begins with background on the city's long history with the slave trade and importance of slave labor to it's antebellum marine economy. From there, the book moves quickly to secession, a movement very popular in Galveston, at least until it's consequences were brought to the island's very shore. This happened quickly with the arrival of the U.S. naval blockade in the summer of 1861. Inadequately prepared for defense, the whole island was evacuated by the Confederate army in late 1862, setting up the land-sea battle that ultimately decided who would hold the city for the rest of the war. 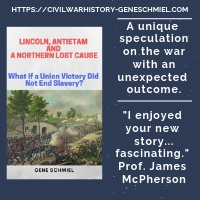 Like many other Civil War local histories from this publisher, Schmidt's book seeks to engage a wider audience through a focus on lively writing and human interest storytelling. What sets Schmidt apart from the majority of local history writers with similar goals is his discontent with the all too common practice of dressing up poorly documented history with tale spinning. His book is a story-centric narrative but it is well researched and footnoted using a variety of primary and secondary sources. The following are a few examples of the type of historical material presented in the book. There's an appreciation of the Ursuline nuns of Galveston, who tended to the sick and wounded of both sides. How the Confederate authorities dealt with trouble in the ranks, as well as pro-Union civilians, is also discussed. Galveston's role as a haven for blockade runners, one that became even more significant as the war dragged on and the other Gulf ports were closed, is traced. The terrible yellow fever epidemic of 1864, which killed far more soldiers than all the 1861-65 fighting combined, is another important event explored in the book. Most Civil War local history writing is primarily directed toward area residents that are interested in some aspect of their community's past but are coming to the subject with little background knowledge. 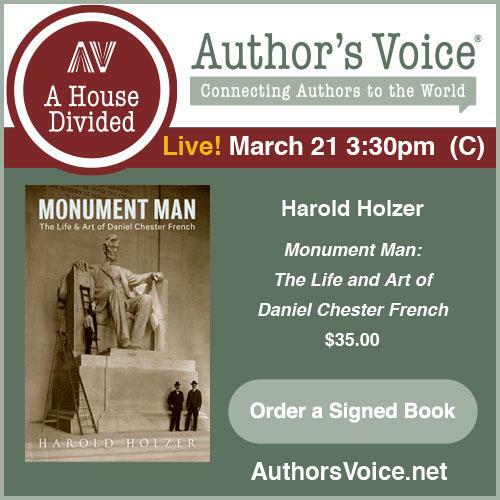 Galveston and the Civil War will serve this audience well, but with the added bonus of being able to extend its reach to satisfy outside readers with specialized interests. * The Second Battle of Cabin Creek: Brilliant Victory by Steven L. Warren (The History Pr, 2012). THP's Civil War Sesquicentennial Series has published original studies and a few reprints. The first edition of Warren's 2nd Cabin Creek study was printed in hardcover back in 2002 by Gregath under the title Brilliant Victory: The Second Civil War Battle of Cabin Creek, Indian Territory. Articles exist, but it marked the first time this particular battle was accorded book length treatment. I don't have the hardback available for direct comparison, and there's no mention in the front of the paperback of any revisions or new information, so I can't really say whether any improvements were incorporated into the second edition. CONFEDERATE "TALES OF THE WAR" IN THE TRANS-MISSISSIPPI, Part Three: 1863 Edited by Michael Banasik. "In 1885, the St. Louis Missouri Republican began a Saturday series of articles on the Civil War by the participants, from the lowliest private to the most exalted general. The series ran for two years, comprising in all 94 articles, which dealt with all theaters of the war, including the high seas, from both the Northern and Southern perspectives. Being the home of most readers of the Republican, Missouri figures prominently in the series. Due to the number of pieces on Missouri and the Trans-Mississippi, editor Michael Banasik has grouped them by year. 244 pages, 6 x 9 paperback, illustrations, maps, notes, appendices, bibliography, index. (Published 2012; ISBN: 978-1-929919-45-1) $17.95." The Civil War Florida bookshelf remains comparatively small, with many standard works now fifty years old or more, but there has been a recent uptick. 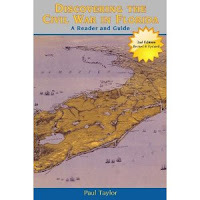 One of the newest releases is Paul Taylor's revised and updated Second Edition of his introductory survey Discovering the Civil War in Florida: A Reader and Guide (Pineapple Press). With most Civil War Florida books focusing on Pensacola or the far NE corner of the state, one of the strengths of Taylor's work is its geographical inclusiveness. He divides the study into four sections: Northwest, Northeast, Central, and South Florida, with chapters under these main headings dealing with the major military events associated with key towns within these regions. They include Marianna, Pensacola, Tallahassee, Gainesville, Jacksonville, Olustee, St. Augustine, Palatka, Cedar Key, New Smyrna, Tampa, Fort Myers, and Key West. As the subtitle suggests, Discovering the Civil War in Florida is not a narrative history. Taylor provides a brief introduction to each chapter (usually around two pages in length), its focus on associated campaigns, skirmishes, and battles. Taylor's reader selections include official reports; book excerpts; magazine, journal, and newspaper articles; and other previously published documents. In terms of relevance and value of information provided (in places, quite detailed), the elements of the reader are uniformly well chosen. Residing at the end of each chapter is a section listing one or more sites for readers to visit. In addition to several paragraphs of descriptive text, photos, visitor hours, directions, entry fees, and website data are provided. An appendix lists the Florida military engagements previously arranged inside Dyer's Compendium. The bibliography and reader's guide are up to date and together offer readers a good sense of the available literature. Discovering the Civil War in Florida is not an exhaustive record of military events in the state, nor is it meant to be. What is does do, and does well, is offer readers of all levels a sense of the scale and extent of the fighting in Florida, a broad introduction that will hopefully inspire readers to delve deeper and prospective authors to help fill remaining gaps in the historical record. * - The 2nd Edition adds new sites and updated visiting information. There are also new documents, maps, and photographs. With all the clashes of 1862 that received nary a mention in the catalogs of 2012, we can take comfort in being fully compensated for the loss with a fresh sequence of ground breaking studies dealing with an all but unknown 1863 battle. A Field Guide to Gettysburg: Experiencing the Battlefield through Its History, Places, and People by Carol Reardon and William Thomas Vossler. Gettysburg: Lee's Grand Gambit by Jason M Frawley. Gettysburg: The Story of the Battle with Maps by Stackpole Books eds. Gettysburg: The Last Invasion by Allen C. Guelzo. Eyewitness to Gettysburg by James I. Roberston. Gettysburg, 1863 by Brooks D. Simpson. TIME Gettysburg by Time Magazine ed. staff. Gettysburg: A Graphic History of America's Most Famous Battle and Turning Point of The Civil War by Wayne Vansant. Confrontation at Gettysburg: A Nation Saved, a Cause Lost by John Hoptak. Just an early sampling. I could count on one hand (with four fingers shot off by a Minie ball) how many of the above I actually want to read. Gary Gallagher's The Union War (Harvard, 2011) is the winner of the Tom Watson Brown Book Award. It's a new award (the first biennial winner was Daniel Sutherland in 2010), but has instant prestige given the $50,000 check and the Society of Civil War Historians oversight. 1. The Fight for the Yazoo, August 1862-July 1864: Swamps, Forts and Fleets on Vicksburg's Northern Flank by Myron J. Smith, Jr. (McFarland, 2012). Those familiar with Smith's many other books dealing with naval vessels and campaigns on the western rivers will know what to expect from his new book in terms of depth of research and operational detail. The Fight for the Yazoo covers various recon expeditions, Chickasaw Bayou, Yazoo Pass, Steele's Bayou and a host of other actions associated with the approach of Union troops on Vicksburg and after the capture of the Hill City. 2. The Great Blue Army Wagon by Thomas Lindmier (Carriage Museum of America, 2012). There are many books about Civil War era weapons, uniforms, and equipment but I don't recall any studies of wagons. This oversize paperback covers horse drawn transport before, during, and after the Civil War, and is pretty brief, but it is packed with nerdy wagon stuff. "Cool. 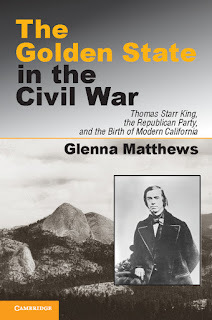 John W. Robinson's Los Angeles in Civil War Days, 1860-1865 is scheduled for a May 2013 release. It's great to see a book length study of the Civil War experiences of LA and southern California finally emerge, and University of Oklahoma Press deserves no little praise for publishing it. Keith should be excited, too." I've had my problems here and there with Russel Beatie's Army of the Potomac books, but it is still my favorite series of recent memory, truly epic in scope and insight. In my opinion, its pages contain the best overall portrayal and analysis of the early war in the eastern theater from the Union perspective. Vol. I - The Army of the Potomac: Birth of Command, November 1860-September 1861 (2002). Vol. II - Army of the Potomac, Volume II: McClellan Takes Command, September 1861-February 1862 (2004). Vol. III - Army of the Potomac: McClellan's First Campaign, March - May 1862 (2007). It has now been 5 1/2 years since Volume III was published and still no hint of when the next one will appear. Given the extraordinary ambition of the series, especially one launched so late in active life, it comes as no surprise the original pace could not be continued. Even if we never see a IV (I am hoping Beatie will at least get through the Seven Days and 2nd Bull Run), the work done so far comprises a substantial career achievement. McArthur: "THE ENEMY NEVER CAME: The Civil War in the Pacific Northwest"
Those seeking an education in the Pacific Northwest Civil War experience can point to a number of useful journal articles, theses, and dissertations, as well as other bits and pieces scattered about, but Scott McArthur's The Enemy Never Came: The Civil War in the Pacific Northwest is the first book length study to be published. Though McArthur does at times venture to the far reaches of the PNW, his book is largely centered upon the Willamette Valley of Oregon. This narrower focus than the title implies will disappoint some readers, but it is understandable given the valley's population and its political, economic, and cultural significance (e.g. the capital lies in the valley, Portland is located at its north end, and the most important newspapers hailed from the region). McArthur begins with a brief history of the settlement of the Pacific Northwest and the response of its residents to the outbreak of Civil War. A significant number of settlers were from the border states and the South, and Democratic governor John Whiteaker was not especially keen on participating in the conflict. The author cites the insular political climate, the great distance to the fighting fronts, and the proximity of newly discovered gold fields in Oregon, Idaho, and British Columbia as important factors in the generally poor response to the call for troops (at least in Oregon). Only three regiments, the 1st Oregon Volunteer Cavalry, 1st Oregon Volunteer Infantry, and the 1st Washington Territorial Infantry, were raised in the Pacific Northwest. Unlike the Washington unit, the Oregon formations did not accept Californians and were only able to recruit in fits and starts, never achieving full regulation strength. With the departure of all but a few companies of regulars, the most immediate threat came in the form of restive Indian tribes. McArthur describes many small scale punitive expeditions, the most significant conducted east of the Cascade Mountains. Other threats, imagined real at the time, were omnipresent. Authorities feared uprisings by southern sympathizers in the Willamette Valley and below (perhaps fomented by secret societies like the Knights of the Golden Circle), seaborne threats by the British navy and Confederate privateers, and land incursions from Canada and even the Mormons of Utah. In addition to highlighting these largely groundless fears, McArthur covers responses to them like the suppression of Democratic "Copperhead" newspapers in Portland, Salem, Eugene, Albany, and Corvallis. Civilian and soldier life are also discussed. Frontier existence was isolated and difficult, but the regional economy benefited from the war to some extent. Proceeds from the gold fields enriched both individuals and those that supplied their efforts, and local industries (e.g. wool production, lumber, fisheries, and coal extraction) expanded. The soldiers had the usual complaints of Civil War fighting men, and the usual vices. Exceptional tedium, dreams of mining riches, and the false promise of transfer to the east, all undoubtedly contributed to a high rate of desertion in the Oregon and Washington regiments. The bibliography offers a nice collection of material (including books, articles, newspapers, theses, dissertations, government documents, and manuscript collections) on a neglected subject. While still leaning on oft used primary sources like Royal Bensell and William Hilleary1, McArthur was also able to uncover other interesting on-the-ground perspectives from the archives. Beyond the comparative neglect of the Washington Territory2, my main complaint with the book is with its organization. The writing is choppy and the chapters are largely self-contained discussions. The latter is not necessarily bad, but, in this case, significant gaps in coverage emerge. 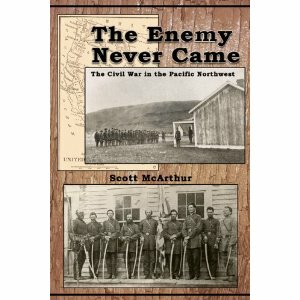 Nevertheless, The Enemy Never Came is easily the most comprehensive introduction to the subject of the Civil War in the Pacific Northwest that one can find in stores. Both author and publisher deserve a great deal of credit for bringing the topic out of the shadows. 1 - Both have been published, Bensell in Gunter Barth's All Quiet on the Yamhill (University of Oregon Press, 1959) and Hilleary in A Webfoot Volunteer: The Diary of William M. Hilleary, 1864-1866, edited by Herbert B. Nelson and Preston Onstad (Oregon State University Press, 1965), the latter much more difficult to obtain. 2 - Happily, historian Lorraine McConaghy plans to publish a study of the role of Washington Territory in the Civil War. Thanks to friend Jim for pointing out the link to the table of contents for the first volume of Kent State's new series of themed compilations of old Civil War History articles. 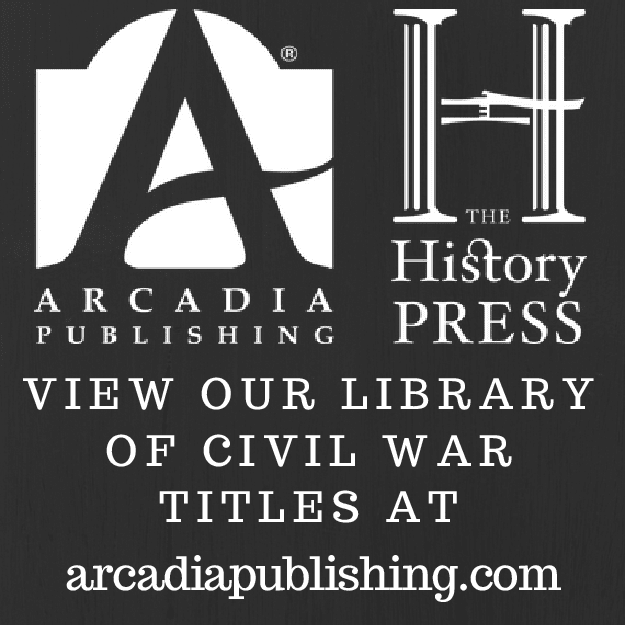 Civil War History Readers, Volume 1: Conflict & Command is a set of 15 military pieces [just click on the 'contents' tap to see the list] edited by historian John T. Hubbell, who also edited the journal itself for 35 years.